Now that my collection is growing, I’m finding it hard to organise and store my sets and bricks! So far it’s not too bad. The sets I own are all built, with only some spare parts sitting around in a tin, and extra minifigs lined up along my PC monitor. I’m ordering new sets in on a pretty regular basis though, so I’m starting to run out of places to not only store them, but display them! BricktasticBlog. (2014). Monitor Minifigs [Image]. In my quest to solve this dilemma, I went exploring on the web. Firstly, I stumbled upon this blog entry in The Seasoned Mom blog. Now, although not a traditional site for Lego, Blair’s post comes up with some options that are pretty great! 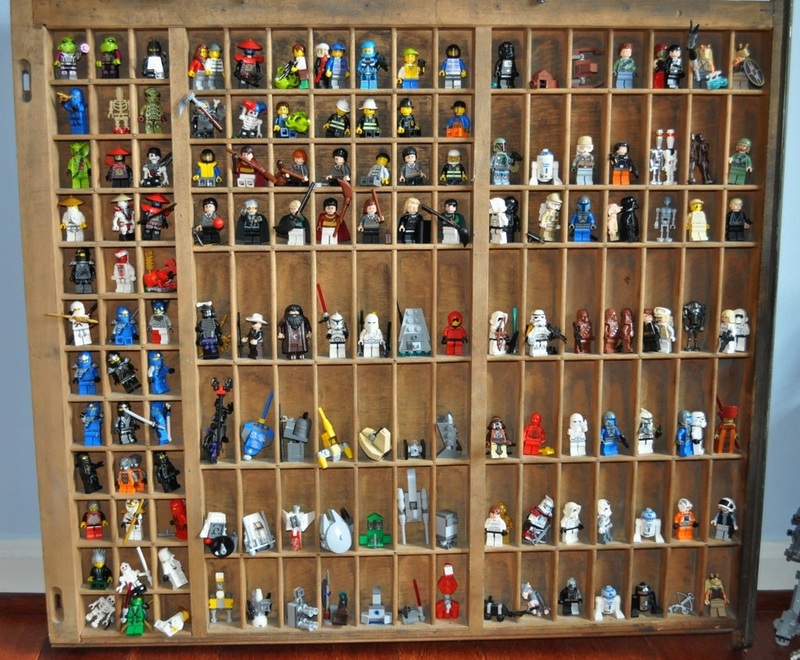 In particular, this idea of finding antique trays to display minifigs. It’s a really effective look! She also has included a great idea of using plastic bin drawers to separate different sets. Go and check it out! Next up is this photo from Boyd’s Flickr page. This table is amazing! There is plenty of space to store bricks in the drawers, and a big space for building on top. I’d say it would be a fair amount of work to build, but the end result is great. Finally, there is this incredible Lego workshop from Scott Stasiuk. Go and check out his other builds – they are stunning! Prepare yourself people, this is mind-blowing. Thanks to Scott for permission to use the photo! Unfortunately I can’t post the image here as I can’t download it, but click the link to check it out. It’s amazing! 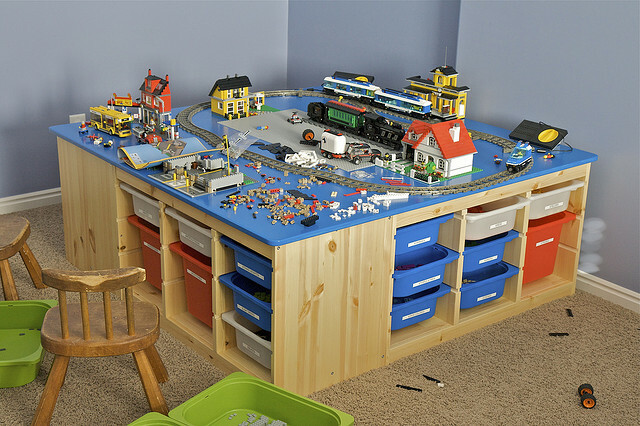 With special storage areas for colours, boards and more, this room is Lego heaven! I think it’s time to build an extension on my house for future planning. That’s what I’ve found – something for all types of Lego collections! What options have you used? Anything you’ve built especially for this purpose? Let me know in the comments.